Thankfully, I forgot to take my camera to Partizan ... so showteamer, Chris, made sure he got some pictures for us with his camera (which is better than mine!)... Excellent. 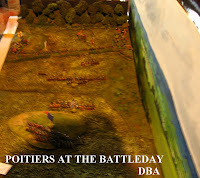 Basically, the game is a part-way DBA Big Battle ... the English have a standard DBA army, but a position magnifique (to borrow, appropriately enough, from the French ...).. 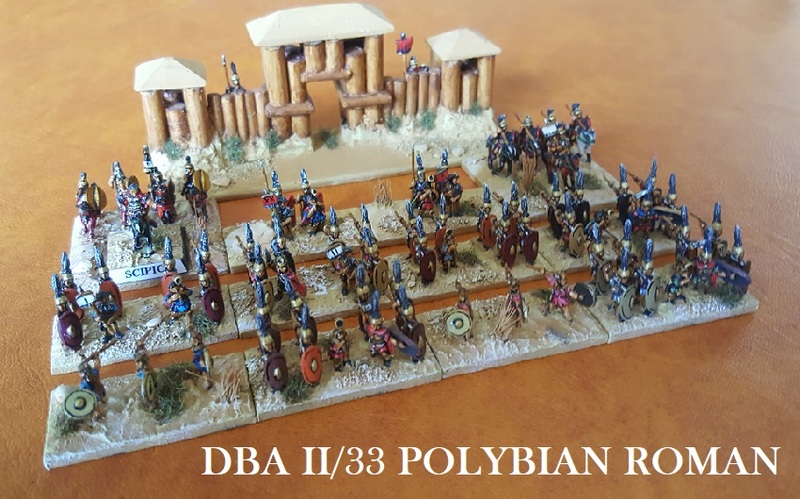 The French have 2 DBA army sized battles (+ the Marshals as supernumerary elements not counting for losses ..).. representing the first and third parts of the army... with which to assault it. The whole of the French army is deployed on foot, with the exception of the two Marshals of France, Clermont and D'Audrehem. The Black Prince is provided with a foot or mounted element, and chooses which to be when he first moves in the game. 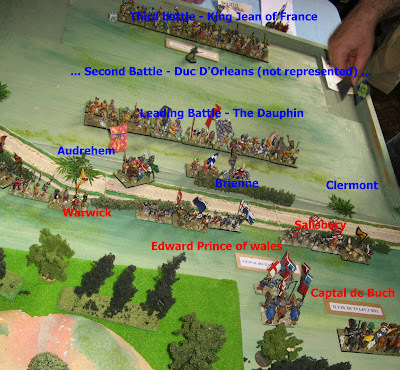 The second French Battle commanded by the Duc D'Orleans did not participate in an organised way, so is not represented. 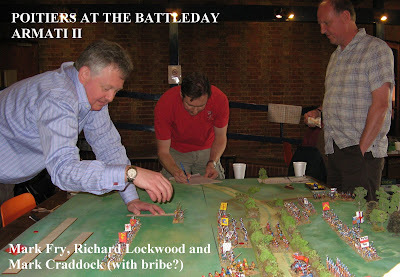 This shows me removing the defeated Prince of Wales from the first game of the day (losing all ends up to a red hot youngster - becoming a speciality of mine, it seems). 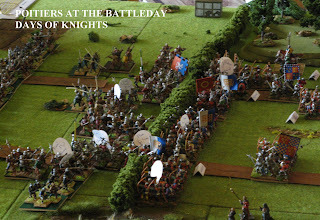 Aficionados of the game will well understand that once in combat, you might get overlapped, and an overlapped Knight General can end up fighting on a 3 against an overlapped Blade on a 2. This creates that situation where the battle can be immediately lost if you roll 1 and the youngster rolls a 6. 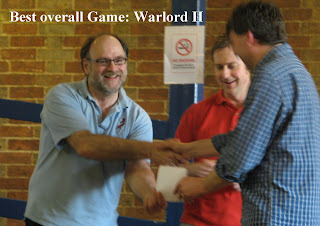 There is a rule of wargaming which predicts this will always happen. The pictures show the first evolution of my new terrain, replacing the commercially pre-flocked boards we used at Triples earlier in the year. It was a partial success. I have tried to copy Mark Craddock's 'rolling foam' idea which looked so good at the Society of Ancients Battleday (remember these ...) ... but my colouring was far less lush, and my foam was lifting a bit at the edges .... Version 2 will be much better! 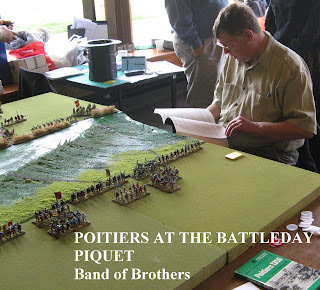 Returning to the scenario, I've dealt with the Captal de Buch's outflanking manoeuvre by borrowing some bits from HOTT: if the English roll a 6, they can use it to allow the Captal and his detachment to slip away from view (behind the hill, as it was, historically) ... if/when another 6 is rolled, the concealed force may reappear anywhere on the table edge. This has worked very smoothly to allow the English their outflanking stratagem. But overall, did the hugely advantageous English position allow them to survive having to fight two French armies, one after the other? 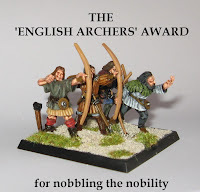 Thanks to the Newark Irregulars for their hospitality, and to Dave Lanchester of the Lance & Longbow Society (with who we team up for this show - and who is very forgiving of my idiosyncrasies!)... Thanks to the players for making it fun. 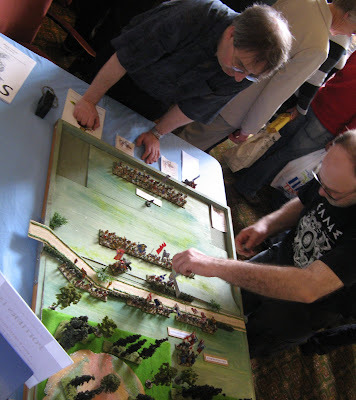 We will be in Birmingham next weekend, at the UK Games Expo... We don't have a full 'wargame' space, but I will take along Gladiolus and some of the other SoA games (if anyone wants to try them out). 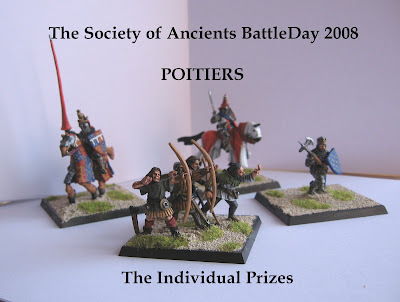 I would love to hear from Society of Ancients members who might be able to lend a hand over the weekend (at the Expo, or any of the scheduled events - we could always do with more). Don't hesitate to get in touch. 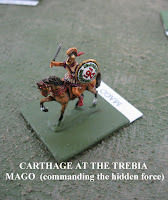 CARTHAGE AT THE TREBIA ... Neil Thomas's Ancient and Medieval Warfare meets the public of Milton Keynes. What? Well yes ... Campaign is MKWS's annual 'open day' ... and unlike most, with the Milton Keynes club, it really is open. As you can see, the event is held in the middle of Milton Keynes Central shopping Complex - the Middleton Hall exhibition concourse. 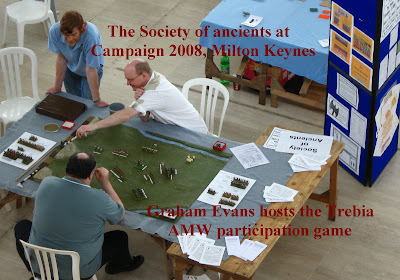 Once a year, organisations like the Society of Ancients get to respond to their broader mission, and try to interest members of the public in wargaming and military history. And, although the National League event ensures there are plenty of 'converted' to preach to at lunch times, with a pitch right at the perimeter of the space, we are with the shoppers and browsers for most of the weekend. We were also joined, an unexpected but welcome surprise, by Chris Webber (whom Society of Ancients members will appreciate for his fascinating insights into the ancient Thracians) ... Good to see you, Chris, and thanks for helping out. 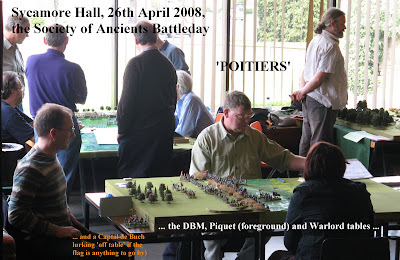 For our game this year, Graham Evans volunteered to polish up his 20mm plastics for a Rome against Carthage taster game using Neil Thomas's rules from 'Ancient and Medieval Warfare'. 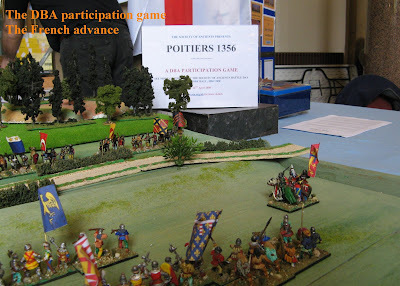 His stated aim was "..to prove you can put on a proper wargame as a participation game for complete novices...". We think he succeeded. 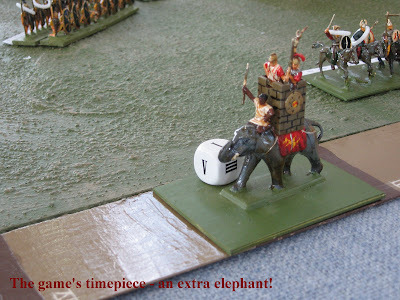 The famous action of Hannibal on the Trebia was chosen for this game for obvious reasons ... it features the Romans, and perhaps their most celebrated adversary, and is a battle in which the elephants which so famously crossed the Alps fought in significant numbers: we therefore thought it would tick quite a few 'recognition' boxes. 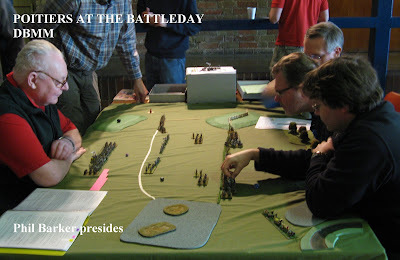 The action, of course, features an encirclement, and is a battle involving both bloody hand-to-hand fighting and grand tactical movement .. and so can showcase what the wargame with model soldiers does best. 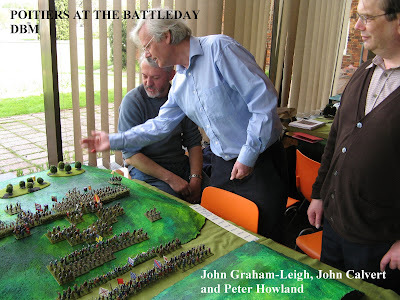 Graham's custom prepared battle board, and neatly organised ancillaries maximised the chances it would look good, too. The decisive battle in northern Italy was prompted by the arrival in Cisalpine Gaul (the area of the Po valley, and modern Piacenza and Cremona) of Tiberius Sempronius Longus with reinforcements for the Consular army he and Scipio jointly commanded and with a will to force a battle. Scipio had been wounded in the Cavalry skirmish on the Ticinus, so Sempronius had de facto control. 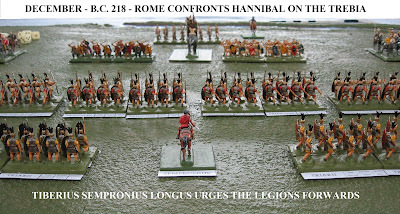 Hannibal, commanding the Carthaginians, and sensing he could draw Sempronius into an attack, had sent his brother Mago off on detachment into the hills to ambush the Romans should they oblige. Responding at dawn to deliberate goading by Numidian raiding parties, the Romans set out ill-prepared but eager. 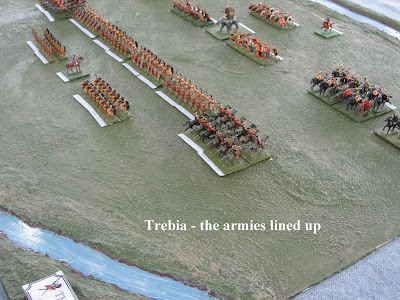 Without the niceties of scouting or breakfast, they waded the icy waters of the Trebia and deployed for battle more or less on ground of Hannibal's choosing ... confident of the power of their legionaries ... seemingly unconcerned by their inferiority in cavalry ... and unaware of Mago's hidden force. 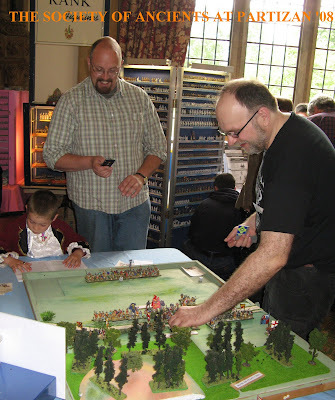 Thus formed up on the battlefield, this is where the players take control of the armies. 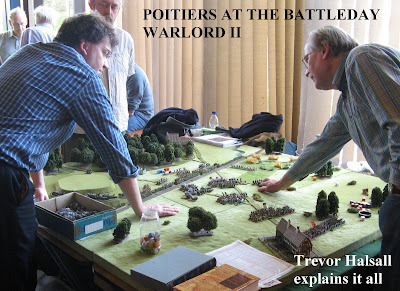 The game was a slightly adapted version of that explained in Neil Thomas's book. 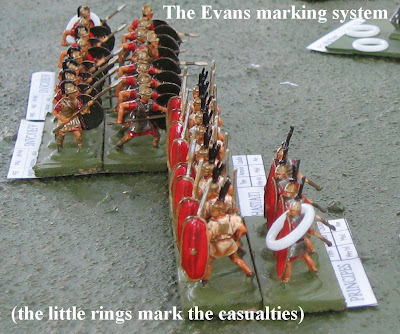 The tweaks were most evidenced in the layout of the armies, the distance between the battlelines, and the scenario allowing the Romans to move first (giving a crucial 'one turn's head start' to the Roman assault on the less powerful Carthaginian centre ..).. All the troops were labelled with their designations and game information ... plastic rings were used to mark casualties. 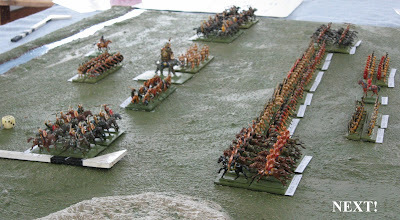 The Romans had the standard eight unit army, the Carthaginians starting with only seven on table (and no guarantee they would get that disadvantage corrected). Mago's arrival was diced for on a turn by turn basis (with a simple time track beside the board). The personality figures were decorative. 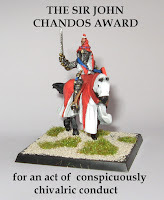 The only major change that was made to the rule system was to double the number of dice in heavy cavalry melees to get the action over quicker. 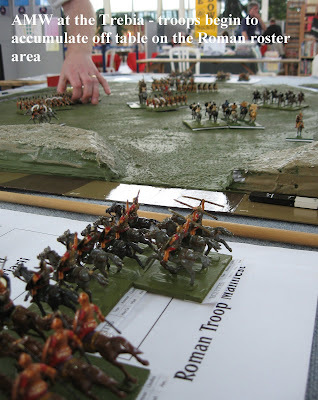 Each army had a roster area at the side of the table so that lost units could be moved there, helping manage the game (particularly with non-wargamers). Mago's arrival was often 'the icing on the cake', the Romans having already succumbed to encirclement due to their already weak flanks. However, careful playtesting and adjustment of the scenario meant that the game was nearly always in the balance til the latter phases, and the Roman power in the centre will sometimes prevail. Quite like history, really. The labelling and roster areas made resetting the game quite quick, and the games proved varied, entertaining and simple to play. Game 1: Graham Carthage, participant Romans. Carthage wins, due to elementary mistakes from Roman player - fails to engage sufficiently strongly in the centre. Plus Mago turns up early. Game 2: Graham Rome, participant Carthage. Rome wins, due to over zealous attack by Carthage in the centre & reluctance on the wings. Plus Mago turns up late. 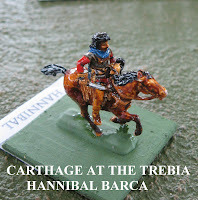 Game 3: Graham Carthage, participant - 9 year old out for day with Grandad - Romans. Espouses Romans are the greatest thing ever. Clear from fellow stand operators that we need to encourage this enthusiastic type of young player. He wins marginal victory. Graham finds out how hard it is to throw a game playing as Hannibal. Game 4: Graham Rome, participant Carthage. Opponent is experienced Armati player. He loses due to over zealous attack by Carthage in the centre & reluctance on the wings (again). Gets units in the middle in a tangle and can't deploy properly. Elephant dies and goes berserk into one of his units, the African veterans. Game 5: Chris Ager Rome v Chris from Oz, Carthage. Chris from Oz has to go and check out from his hotel & Graham takes over. He survives one more turn. Can't really work out how on earth he got in this mess. Game 6: Graham Rome v participant Carthage. Roman win, as Carthage again engages too quickly in the centre. Throws game away by charging unengaged Triarii with Numidian light horse, that die in a turn. Plus elephant goes berserk and hits African Veterans again. Game 7: Graham Carthage v participant Rome. Quote from Graham "Now I really didn't want to play this game, as it was getting late on in the day. However, as I knew the participant and he remarked that I was afraid to get beat, I couldn't really turn away. This was the most crushing win of the weekend, with the Romans going down 6 units to 2. I employed the novel tactic of about facing my centre and running away. 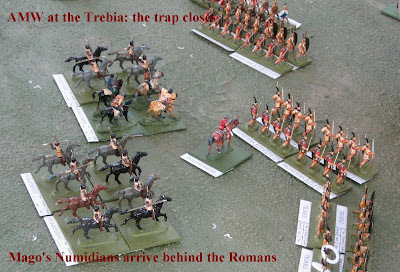 This drew the Romans on into a Cannae like trap. I also managed to punch a hole through the middle with my elephant which then rampaged into one of the reserve triarii units. Then Mago turned up at the end of turn 1. As I fell back my opponent finally twigged it was a trap, but by that point his front line was sandwiched between Celts/Scutari to the front & Numidian horse from behind. Job done." So that made it 5 wins for Rome, and 2 for Carthage. Maybe that Hannibal was a genius after all. 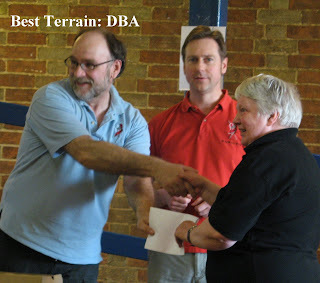 Our thanks, of course, go to MKWS for providing such an excellent opportunity to meet people and demonstrate the ancient wargame. Great show, and very well organised. 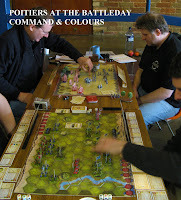 Hopefully the photos I have collected will give a good impression of the excellent variety and quality of games exploring this fascinating battle in parallel - and some hint of the differences in approach ... from Warmaster's 'cast of thousands' to Warlord's carefully recreated battlefield. 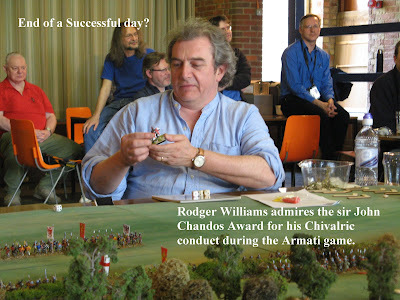 And Rodger Williams won the Chandos award for chivalric conduct in the Armati game ... moving his crossbowmen aside to make way for their betters - and forfeiting their shots at the Black Prince's (by then crippled) bodyguard .. in proper wargaming fashion, Rodger rolled the dice anyway, to see what might have been - and rolled the sixes that would have destroyed the English veterans (and maybe won the French the battle). 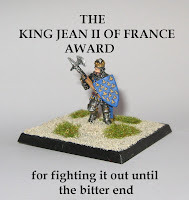 The French Men-at-Arms that came through were mercilessly cut down, of course.